we don't simply sit and just do meditation, but live our lives completely, without any mediation between ourselves and those we meet. And in doing this we transform our day to day lives from the boredom of riding the bus, the unending demands of our jobs into a life of practice and peace. Trikaya Zen Center is a new practice center in Tacoma Washington. We are a small group, currently, with a small Zendo, but with all the curriculum available in the larger more established Zen Centers. 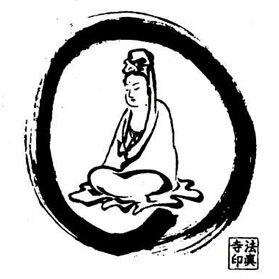 We practice Soto Zen here in the tradition on Taizan Mazumi Roshi's White Plum lineage, so we offer a range of practices including both Koan Practice, and Shikan Taza (Just Sitting). This center has been created with working people in mind, people who have busy schedules and who, while unable to maintain the full monastic schedule of meditation practice throughout the week, still wish to maintain a healthy practice in their lives. People at any level of practice can find a welcome here, whether you are a beginner learning how to sit comfortably, to a practitioner, with years of practice under their belt, hoping to work on some of the later books in our Koan curriculum. There is something for everybody here. We are open weekends, both Saturday and Sunday at 10:00 AM, as well as Tuesday evening at 6:00 PM for meditation practice, as well as private interview with the teacher for koan study. We ask that people wishing to sit Evenings to please come on Saturday first, for a general introduction, and more importantly, being able to find the place is much easier during daylight hours. You're not expected to bring anything, just wear some loose fitting comfortable clothes, and you'll be fine. .
has been doing Zen practice since 1982 when he attended his first Sesshin in New York. He started formal training in 1988 when he received Jukai from Genpo Roshi at the Wasatch Zen Group in Salt Lake City, later to merge with Kanzeon Zen Center. He became a resident practitioner there in 1992, receiving Tokudo (Ordination) in 1994. Taido Sensei was the Godo (in charge of the training hall) from around 2000 till he left in 2009, and during that time he received Transmission from Genpo Roshi in 2007. Since leaving, he continues to train under Tenshin Roshi at Zen Mountain Center in Idyllwild California, where he still travels down to attend sesshin under his guidance. Currently Taido Sensei is employed at a company in Seattle as a Systems Administrator and combines the Zen training with his working schedule.